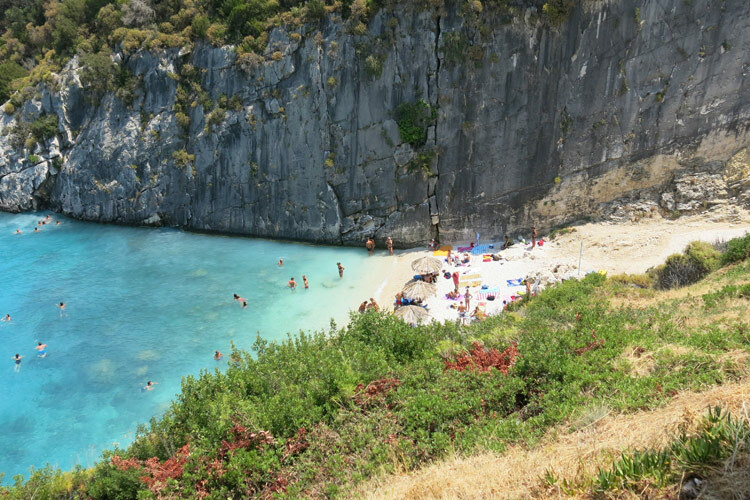 This itinerary will bring you to discover the wild part of Zante that is not still developed from a tourist point of view. This trip through Zakynthos touches the north-east areas of the island and will permit you to appreciate the coast that goes from Makis Gialos bay until Skinari cape and the extreme north of Zante island. Our suggestion is to drive straight to Makris Gialos beach because if you come here soon in the morning you will be able to admire better the incredible colours of tha sea. 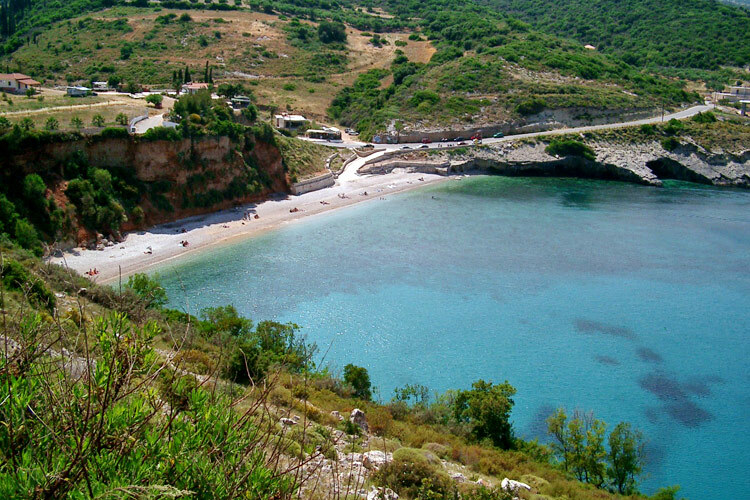 If you’ll come back few kilometers from Makris Ghialos in direction of Alykes, you will reach Xighia beach (you will recognize it immediately for the strong smell of sulphur that reach also the road). Xigia beach is the ideal place to relax yourselves and to have a nice swim in its sulphureous waters. We advice to divide the morning in two parts, so you can visit first Makris Ghialos, then Xigia beach until lunch time. In this way we can take you for lunch in one of the best traditional restaurant of Zante that is very close to Xigia beach and where your meal will be an unforgettable experience. 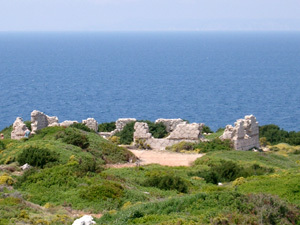 After lunch you have to take again your car to return towards north in order to reach Cape Skinari. The road that we will cover is really wonderful with the island of Kefalonia in front of us that becomes bigger and bigger and with the Zakynthian country side on your right that degrades sweetly until the blue sea. 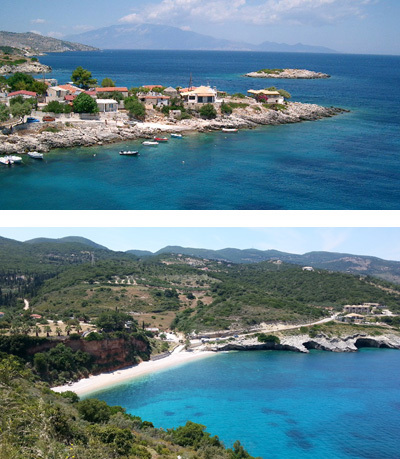 Once arrived in Cape Skinari you have to make a photo, Kefalonia is so near that will seem easy to reach by swim. 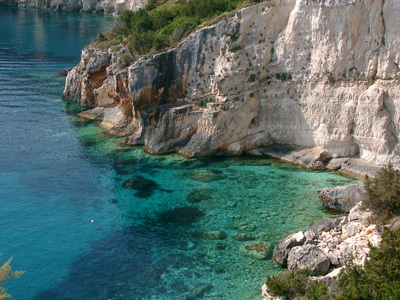 This part of the coast is famous in all Zakynthos for the Blue Caves, that are particular caves where the water of the sea assumes impressive blue glares. There are a lot of boat trips that will take you to discover the Blue Caves leaving from Aghios Nikolaos. It's also beautiful to go down towards the sea with the steps and to dive in the water in order to discover the caves with mask and snorkel! For all those who own their private boat we suggest a trip in this part of coast, from Xigia beach to Cape Skinari as one of most evocative areas of Zakynthos island. For the evening our suggestion is to stop in the tourist town of Alykes, as it is the only one in this zone that offers different solutions both for the dinner and for the night. 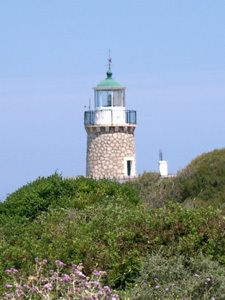 The “by night” extreme activity takes place in the far north part of the island and precisely at Skinari Cape. Drive by night following the road that from Agios Nikolaos goes north, once passed the lighthouse follow the road till you reach an area near the ruins of an old construction. You can live the car here and start descending the steps taking directly to the sea; you’ll notice that before the steps will end you’ll find yourself at the top of a cave dome from where you now have to dive! Diving is very easy there, just a couple of metres, we suggest to try it both for the pleasure of a midnight bath and the sight of the plankton, that moved by your dive, will turn into a fluorescent cloud all around you. Going back to the rocks is easy since the steps you climbed before going down to the sea will take you back but for those who would like to end the night with a further thrill, just under the dive point, there is a gap that if followed will take you to a chamber into the mountain. We suggest choosing a full moon night and to take a torch with you since there are no lights neither on the steps nor close to the sea; be always very careful! Navagio Boat Trips THEODOSIS is a family run business placed in Aghios Nicholaos, in the North part of Zakynthos island, and it will offer you an unforgettable cruise experience to Navagio and Blue Caves. Zanteisland.com declines any responsibility for eventual accidents inspired by activities described above.